As part of our commitment to health and safety, we're putting $10 from every Restube unit purchased online toward hurricane relief efforts. We want to help those affected rebuild and provide Rescue Services with our products for use in future emergency situations like Harvey and Irma. WHICH RESTUBE IS RIGHT FOR YOU? Whether for family vacation or open water training, RESTUBE helps more people to be active in the water, improves safety and gives you more freedom - no matter the circumstances. 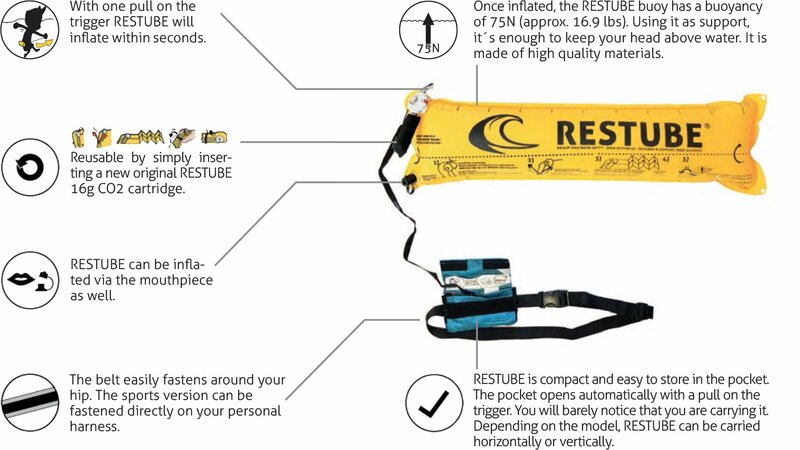 Will inflate when triggered for floatation and to enhance visibility. Browse our different models below based on your interests. FREE SHIPPING on 'Classic' and 'Sports' versions. The simple bag is worn with its waistbelt. It is reduced to its basic function and is perfect for water activities with the family, in your free time, as additional tool aboard a ship, while fishing or canoeing. The stylish pocket can be worn horizontally or vertically at the hip. When mounted vertically the bag has minimal drag while swimming. In addition, a whistle and a small pouch are integrated. 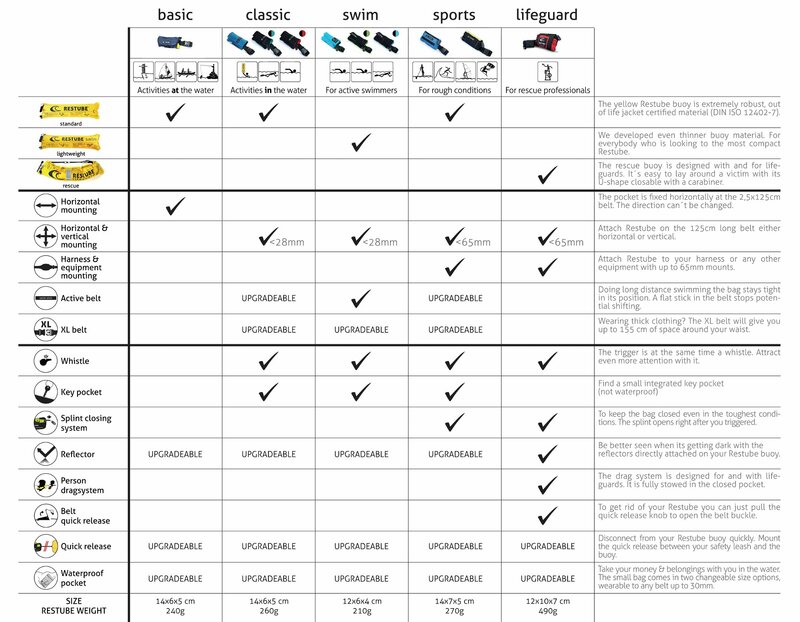 Perfect for swimming, triathlon, open water or any leisure time in the water. Our RESTUBE Swim is the next logical step of the RESTUBE model. With a weight of just around 210g (7.5 oz.) it is the lightest and smallest Restube ever. Because of its compact size and its ultralight material, it is perfect for active and ambitious swimmers, but rest assured - the buoyancy of the buoy is 75N, enough for all body sizes. The robust pocket with its splint closing system and the exchangeable belt system can be mounted directly to the harness or at the belt. It is for rough use and perfect for kite, wind and wave surfing or SUP. The RESTUBE sports also can be used for any other water related activities. More often professionals are using it for additional personal self protection out there in the field. Still have questions? Visit our FAQs page.